The first set of polyhedral dice that I ever got was the cheap, solid plastic set that came in the 2nd edition of the D&D Basic Set that required you to rub each face with a wax marker so that you could discern the numbers. I would carry these dice around with me, long before I finished reading the rulebook and module which were also included in the box, long before I ever even played the game that had already captivated my imagination at that young age. Countless times while trying to explain to friends and family the then esoteric and abstract nature of tabletop role-playing games, I would counter their glazed eyes and puzzled looks by pulling those dice out of my pocket and rolling them on the table, reassuring them with something at least vaguely recognizable. I’ve owned and lost many dice of all shapes, sizes, and colors since those days. Dice are something that I have an abundance of, and I’m constantly adding to my collection as I encounter a new color or new material that looks pretty or feels good in my hand. That said, I’ve managed to avoid the realm of high-dollar, exotic material-based dice market, until now. Artisan Dice specializes in a variety of materials: high-end polymers (“Alchemist’s Dice”), minerals and stones (“Elemental Dice”), solid metals (“Dragon Dice”), and carved bone (“Necromancer’s Dice”). Their specialty, however, is exotic wooden dice, and they have four tiers: “Druid’s Dice”, “Archdruid’s Dice”, “Gaea’s Preserve”, and “Ent’s Dice”, each tier representing a shift in cost and rarity of wood. Artisan provided a set from the Archdruid line made from Bethlehem olive wood with the numbers inlaid with brass in their standard 10 die lineup: One each of 4, 8, 10, 12 and 20-sided, four 6-sided and a percentile d10. The first thing that is immediately striking about the dice is the striped grain of the wood. This unique dark, wavy pattern is a hallmark of olive wood harvested from the Bethlehem area of Palestine, and the roots of these trees date back to biblical times. This wood is generally reserved for artists and craftsmen. The facets of each of the dice are polished into a smooth, deep patina, enhancing the dimensional quality of the wood grain. Another detail that makes this set stand out are the sharp angles, a definite contrast to the soft contours of most modern acrylic dice. Numbers are presented in Blackletter, or Old English typeface. I typically prefer a less flamboyant sans serif font for my dice, but for such an exotic set the gothic style fits better, and the brass inlay demands a thicker character on each face. Regrettably, the grain pattern and color tone of the wood sometimes interfere with the legibility of the numbers, though I found this was more of an issue in dimly lit rooms as the brass actually catches the light pretty well in a brighter environment. Artisan doesn’t strictly follow convention with their number placement on their dice sets. While the d20, d6, and d4 do adhere to the standard N+1 (where N=number of sides), the d10 and d% use N-1, and the d8 and d12 have a different sequence altogether. Curiously, the scale of the dice in the set feels inconsistent- the four-sided die struck me as too small compared to the eight, twelve, ten and twenty sided dice, while the four six-sided are much larger, reminding me more of the hard-edged casino dice you might find in Vegas, which left me wishing all the six-sided dice in my collection were equally large. Obviously this variance in scale doesn’t impact how they roll or their overall aesthetic appeal, but I did find it odd. Furthermore, I found the dice to be considerably lighter weight than I expected, certainly lighter than any of the dice currently in my collection. I’m more partial to dice with a bit of heft, but after a few rolls the luxurious feel of the edges and the smooth polish of Bethlehem olive wood won me over. Rolls were satisfyingly random, and while I was concerned that the natural material might result in a small amount of imbalance, I found no discernable flaws on that front. 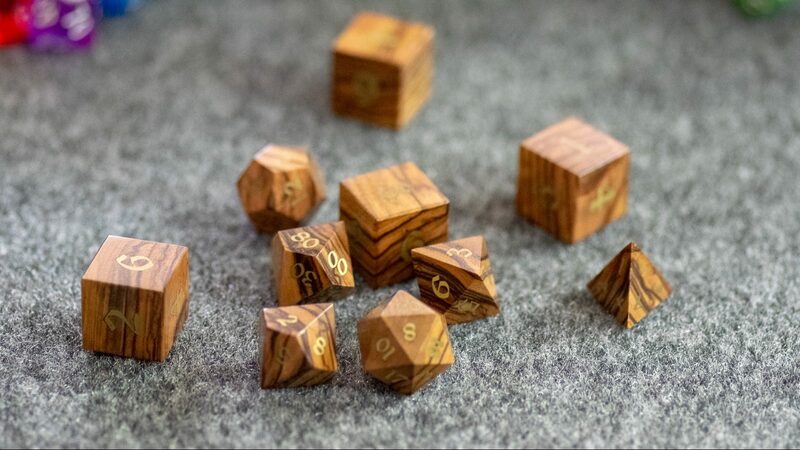 Artisan Dice’s Bethlehem olive wood Archdruid dice are amazingly crafted and eye-catching, an heirloom quality accessory for the refined RPG player. While the set I received had the occasional legibility issue due to lack of contrast or lighting issues, I was very pleased with the feel of the dice and how they rolled. If you are in the market for a uniquely opulent set of dice and want something a little more on the organic side of things, Artisan’s Druid lines are worth the cost. Beautiful, unique grain pattern only found in Bethlehem olive wood. Dice feel great in the hand. Larger scaled six-sided dice are a much better size than the standard. Occasional number/facet contrast issues, especially in dimly lit rooms. Lightness of the wood takes some getting used to. Variance in scale of dice can be a bit jarring.